Providing you the best range of digital gps clock with effective & timely delivery. 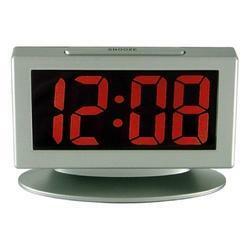 We manufacture Digital Clock that has the superior quality of presence in the entire market. Our digital clock suits all requirements, including LED clocks with 4 & 6 digit displays, console displays, single and double-sided displays plus a range of analogue clocks available in many sizes and styles. Wall mounted, desk mounted, inbuilt console and ceiling mounted options available. Eliminate all wires with battery powered analogue clocks. Comprehensive alarm schedule included in every transmitter clock. Battery backup included for high-reliability operation. All clocks not only display the same time but the correct time as well. High power master clocks are available from 5 to 500 watts.